Proudly received TripAdvisor Certificate of Excellence 9 years in succession. 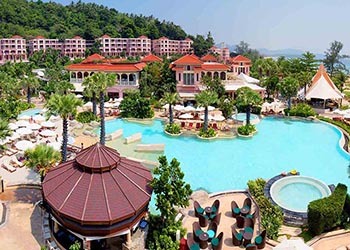 Drawing its design theme from the classic Sino-Portuguese architecture that characterises Phuket Town, Centara Grand Beach Resort Phuket is set directly on the sands at Karon Beach, backed by a green hill, and grouped around its own water park. The resort offers a memorable holiday experience for everyone: couples and families will love the exhilarating leisure activities, the water sports, and of course the water park, and corporate and incentive groups have fine meeting facilities. The accommodation offers a comforting and relaxing ambience for all, and for guests preferring seclusion, the villas provide exclusivity along with great views, and come with the Club category benefits. The award-winning spa, Spa Cenvaree, is a luxurious treat that everyone will enjoy, and has suites for singles and couples. The drive to and from Phuket International Airport is easy and convenient, and takes less than one hour by road.